Maori Tattoo art (real name Ta Moko) is part of the larger family of Polynesian Tattoos and has been practised in pre-European New Zealand for centuries. Ta Moko was used ritually to mark the important passage between childhood and adulthood. To receive it were some of the most high-ranking persons in the tribe, and those without any had the lowest social status. Indeed, tattooing was considered a sacred art among the Maori people of New Zealand and the tattooists (Tohunga Tā Moko) were considered inviolable and sacred (tapu). Considered one of the most advanced skin art design in the world, traditional Maori tattooing was carved into the skin using chisels made of bone and tapped using knifes. The ink was produced form a rather peculiar source, a particular type of fungus infested caterpillar, while the ink for the face was traditionally made with burned wood. The designs consisted of curved shapes and spirals in intricate patterns, normally received on the face, legs and buttocks or, in case of women, on he lips, chin and sometimes neck and back. Far from being solely ornamental, these designs conveyed to those who knew multiple levels of deep spiritual meaning and cultural heritage. 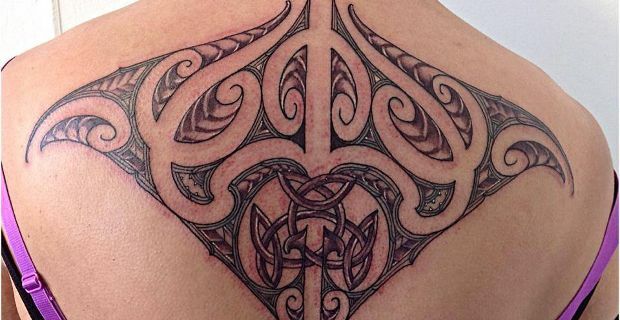 Also thanks to its elegant and flowing design that perfectly fits and enhances the anatomy of the human body, traditional Maori Tattoo art has become extremely popular worldwide. Over the past 20 years, many a celebrity have marked their skin with this ancient Polynesian art form: Rihanna has a small Maori tattoo on her wrist, Robbie Williams has had a large design inked on his left upper arm and shoulder, while Mike Tyson famously inked a side of his face with a bold Maori pattern. Famously ergonomical, traditional Maori tattoo design with its sculptured shape and patterns fits body forms in a way that reminds of traditional Oriental tattoo designs, for instance the Japanese cloud pattens (Koruing).